Time for the Gold Option Trade? Until recently, the world has forgotten about gold and gold futures prices it would seem. A few years ago, all we heard about was gold and silver futures making new highs on the back of the Federal Reserve’s constant money printing schemes. However, after a dramatic selloff the world of precious metals it became very quiet. It may be time for a gold option trade. 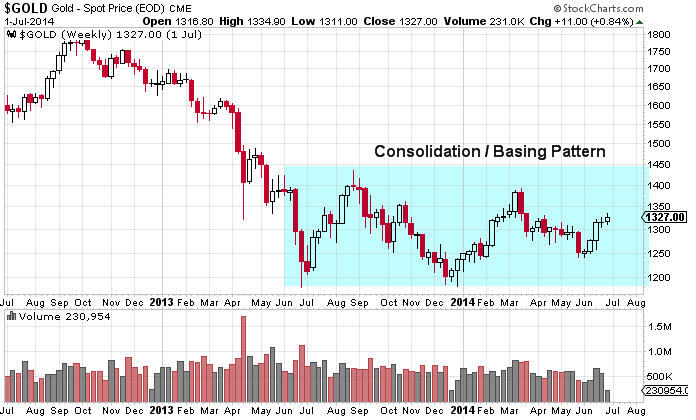 Gold prices have been in a giant basing or consolidation pattern for more than one year. As can clearly be seen below, gold futures prices have traded in a range between roughly 1,175 and 1,430 since June of 2013. 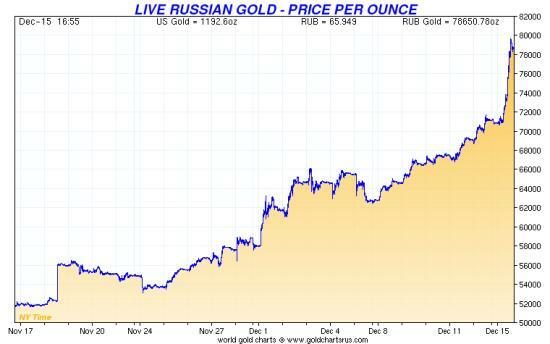 The past few weeks we have heard more about gold prices as we have seen a five week rally since late May. I would also draw your attention to the fact that gold futures also made a slightly higher low which is typically a bullish signal. At this point in time, it appears quite likely that a possible test of the upper end of the channel is possible in the next few weeks / months. If price can push above 1,430 on the spot gold futures price a breakout could transpire that could see $150 or more added to the spot gold price. Clearly there are a variety of ways that a trader could consider higher prices in gold futures. However, a basic option strategy can pay handsome rewards that will profit from a continued consolidation. 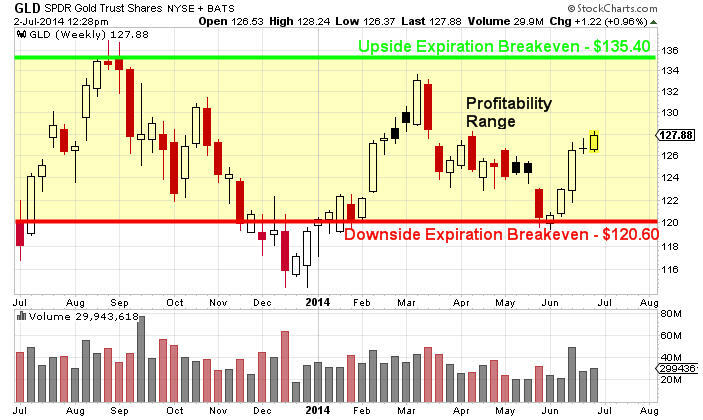 The trade strategy is profitable as long as price stays within a range for a specified period of time. Ultimately this type of trade strategy involves the use of options and capitalizes on the passage of time. The strategy is called an Iron Condor Strategy, however in order to make this trade worth while we would consider widening out the strikes to increase our profitability while simultaneously increasing our overall risk per spread. Consider the chart of GLD below which has highlighted the price range that would be profitable to the August monthly option expiration on August 15th. As long as price stays in the range shown above, the GLD August Iron Condor Spread would be profitable. Clearly this strategy involves patience and the expectation that gold prices will continue to consolidate. This trade has the profit potential of $37 per spread, or a total potential return based on maximum possible risk of 13.62%. The probability based on today’s implied volatility in GLD options for this spread to be profitable at expiration (August 15) is roughly 80%. Our new option service specializes in identifying these types of consolidation setups and helps investors capitalize on consolidating chart patterns, volatility collapse, and profiting from the passage of time. And if you Advanced options trades are not your thing, we also provide Simple options where we buy either a call or put option based on the SP500 and VIX. The nice thing about buying calls and puts is that you can trade with an account as little as $2,500. I continue to monitor the Gold/Oil ratio (GOR). The last time I wrote about it was December, 2008. At that time Gold closed that day at $837 and Oil closed at $42.36. That is a GOR of 19.75. Notice there were two peaks, a three step drop, a double bottom and then a BIG rally. We are experiencing the same thing again. We don’t see the first peak in 2011, then we have a three step drop, a double bottom and then… I think we may be setting up for another rally in Gold (and Silver). Oil is now at $106, Gold is $1,317. At a GOR of 20, assuming Oil stays the same, Gold could be trading at $2,120. With all the chaos in the world, suppose Oil goes to $150. Gold could then be $3,000. Silver is currently $21. At $2,120 Gold Silver could be $141; At $3,000, Silver could be $200.